AlterNatives is a space of speculation that brings together artists, thinkers and innovators to think creatively on contemporary life as it unfolds. It is also about inserting the past into the unfolding future, taking what we can learn from its version of science, cultivated wisdoms and abandoned innovations. 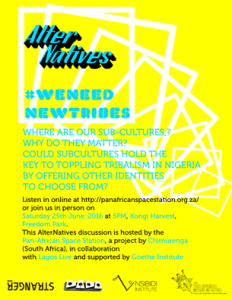 Through recorded conversation, thought experiments and workshops, this event series hopes to uncover some of our best kept secrets and push the boundaries of thought on the possibilities for a re-imagined Nigerian society. This is a project by Nsibidi Institute, in collaboration with Stranger Lagos and DADA (Dream Arts & Design Agency). Category: Articles | Tags: AlterNatives, PASS Lagos | Bookmark: permalink.